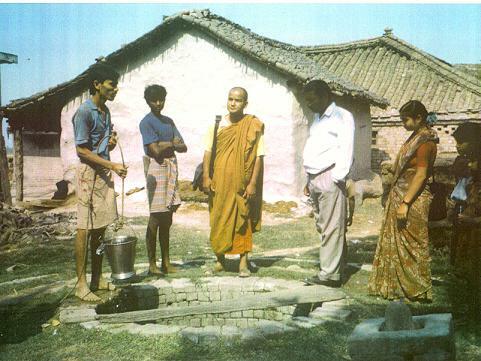 During April 1999, Global Resources Institute and the International Buddhist Society sampled and tested the water from nine villages in the Lumbini area, collected data relevant for project planning, discussed water and health conditions with people in the villages, and made preliminary field tests of the solar disinfection technologies. The study was very successful in its confirmation of the effectiveness of solar disinfection and obtaining valuable insights for further work. It must be emphasized that this study was a preliminary survey of a sample of the water sources in the area being served by the International Buddhist Society. Single water samples were taken from representative water sources in eight of the 17 villages served and in Lumbini. The purpose of this study was to provide some initial data to guide the design of a more complete study of the water supplies and to offer some initial insights into the attitudes and needs of the villagers, the conditions of water supply and sanitation and, requirements for program development for improving water quality. The water samples were collected from a total of 42 sources of drinking water including tube wells, one artesian well, open wells, and river water. In all cases the water was being used for drinking water without boiling or other forms of disinfection. Testing was carried out in a field laboratory set up at the medical clinic in Lumbini and all samples were tested within four hours of collection. Each sample was tested by both membrane filtration and hydrogen sulfide testing. The membrane filtration tests made use of a combined total coliform and e-coli test recently developed by the United States EPA. Although the two tests do test for different bacteria as indicators of unsafe water, they agreed in over 80% of the cases tested. Testing of the solar disinfection technologies was carried out using water from a 190 foot household tube well located in Lumbini. The water obtained from this well consistently tested with e-coli counts in the 20 to 30 colony forming units (CFU) per 100 ml. range. (Generally accepted standards allow no e-coli.) The solar disinfection tests included bottles placed in shade, direct sunlight, on a rack with a black surface made of corrugated steel roofing material in direct sunlight, and in a solar reflector which provided a concentration of sunlight of approximately four to one. The intensity of sunlight was recorded on a data logger using a Kip & Zonen CM3 solar pyranometer. In order to compensate for differences in the intensity of sunlight during the day, the amount of solar influx recorded by the solar pyranometer was used to calculate the amount of sunlight received during the test of each bottle. Temperatures were recorded for ambient air, the bottles on the rack and the bottles in the solar reflector. A total of 22 shallow wells less than 60 feet deep and a total of 9 deep wells greater than 150 feet deep were sampled. With a few exceptions the location and condition of the tube wells were not optimal with regard to sanitation. Many of the tube wells had ground level seals of minimal quality, were without pads to divert waste water, and were located among livestock. 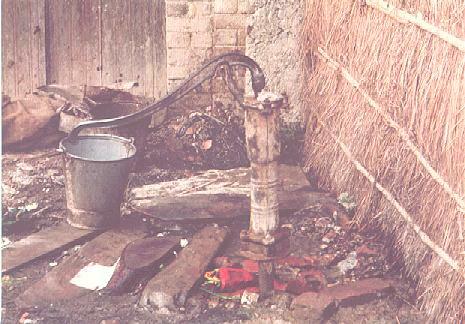 In Lumbini many wells were in backyards of homes adjacent to toilets and septic pits. Other wells were located on the street adjacent to the open sewer. Even in the very dry conditions existing at the time of the survey, the likelihood of contamination by seepage appeared great. During times of flood conditions, the likelihood would be considerably greater. Seventy-five percent of the tube wells were found to contain bacterial contamination. Another source of contamination is the cow dung used as a bore hole sealant in the sludge drilling method which is used for all well drilling. A total of 9 open wells were sampled. These wells were all hand dug wells approximately six to eight feet in diameter with water levels at 20 to 30 feet. With one exception the open wells had no covering and had varying amounts of debris on the surface of the water. The one covered well was fitted with an adjacent hand pump to access the water. Most of the open wells had slightly raised openings and were located away from household and animal congestion. All of the open wells tested with total coliform and e-coli counts greater than 200 per 100 ml. The one artesian well sampled is located at the refugee camp in Lumbini. It was drilled by the government eight years ago and has a depth of approximately 700 feet. Its water produced no signs of coliform or e-coli bacteria. 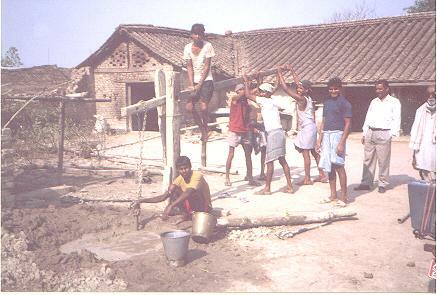 There are many such artesian wells located in the countryside, mostly away from the villages. Much of the water is used for irrigation. The one sample of the Dano river was taken from the one village in the sample in which the poorer inhabitants do use the water of this river for drinking. Buffalo were resting in the slow moving water at a point just upstream from the village. The water produced an e-coli count of 360 per 100 ml. In every village but Sonbarshi, inhabitants complained about stomach problems. In some cases this was attributed to poor quality of drinking water. In other cases, there seemed little awareness of the possible linkage between unsafe drinking water and gastrointestinal problems. In none of the villages was boiling of drinking water a standard procedure. At the same time there was considerable concern about health. People welcomed the opportunity to have their water tested. In many cases owners of wells which were not sampled asked that their wells be tested. In some cases villagers brought samples of water to the medical clinic in Lumbini for testing. When owners of some of the unsafe wells in Lumbini were shown the petri dishes with colonies of bacteria from their wells, they became very concerned and in some cases started boiling their water in spite of the cost of doing so. The field tests did confirm the effectiveness of solar disinfection. Tests were made to determine the time required for disinfection using bottles in the reflector, bottles on the blackened rack, bottles set in direct sunlight and bottles set in open shade. Also, tests in direct sunlight were made with an aged, scratched and discolored bottle for comparison with newer bottles. In all cases the water was disinfected within one to eight hours depending upon the method of exposure. The average solar influx during the period of 0800 to 1600 was 5450 Watt hours per square meter (5450 Whr/m2). The average solar influx during the period 1000 to 1400 was 3201 Whr/m2 or approximately 59% of the daily total. It should be noted that the solar influx was somewhat reduced by the dust and haze in the air. Solar disinfection of bottles in direct sunlight required approximately 4700 Whr/m2. This would correspond to five to six hours of direct sunlight during the peak period of sunlight during the day. The differences between the new and old bottles were undetectable within the limits of the tests. Solar disinfection of bottles on the blackened rack required approximately 3000 Whr/m2. This would correspond to three to four hours of direct sunlight during the peak period of sunlight during the day. The temperature of the bottles on the blackened rack rose about 10 degrees Celsius above air temperature to a maximum of 50 degrees. While this does speed the disinfection process, it is not at pasteurization temperatures. Solar disinfection of bottles in the solar reflector required approximately 1000 Whr/m2 to achieve solar disinfection. This would correspond to as little as one hour of direct sunlight. The solar reflector was capable of reaching temperatures as high as 80 degrees Celsius which is well above pasteurization temperature. When temperatures were in this range, disinfection occurred in less than 30 minutes. The bottles placed in open shade did disinfect within the period of 0800 to 1600. Since most potential users of solar disinfection have indicated that their preferred method of operation would be to use a blackened rack and to begin exposure in the early morning of the bottles of water they will use the next day, solar disinfection does provide a viable alternative for water purification. Although tests in cloudy conditions will be required, it does appear that sufficient ultraviolet solar radiation will be available for disinfection even in these conditions. The survey provided a number of observations and conclusions which will help in planning further work. They indicate a number of levels of intervention ranging from minimal change and least cost to more extensive introduction of technology and equipment. 1) The survey indicated the importance and the primary role of water quality testing. Testing is not only necessary to distinguish safe water from unsafe water, but to monitor the effectiveness of methods to improve the quality of drinking water and to educate common misconceptions regarding safe water. In many cases simply identifying safe sources of drinking water will allow encouraging the use of those sources rather than unsafe sources. In a village having 25 or 30 wells, there is some likelihood that at least a small number of these will be free of bacterial contamination. By making necessary arrangements for the common use of these wells for drinking water, considerable reduction of water borne disease can be expected. Discussions with owners of wells indicated a general willingness to share wells for drinking water as long as people did not come to wash or water animals. The two common misconceptions regarding safe water are that the clearer water contains fewer bacteria than less clear water and that wells deeper than 150 feet provide safe water. There was great surprise that some of the 40 foot wells produced safer water than some of the 190 foot wells. Also there was surprise that some of the cloudy water was safer than some of the clear water. Only testing will identify safe water. Testing also can provide a powerful educational and motivation tool. The use of a filter membrane method, which allows visual inspection of colony forming units, is a powerful education device. Numerous families became very concerned about their water when they saw the colonies of bacteria on the petri dish and became very interested in what they might do to disinfect their water. 2) In many cases it is likely that improvement in water quality can be obtained by improving well sanitation. Making certain that wells are properly grouted and sealed, that they have proper pads for drainage of waste water, and that only clean water is used for priming, are all simple and inexpensive methods of decreasing bacterial contamination. 3) Shock chlorination of wells, which is not currently done, can be of benefit. The well drilling methods used in most of Nepal make use of a sludge containing animal dung which has a high probability of introducing bacterial contamination into the well and into the aquifer. The simple procedure of shock chlorination may, in some cases, remove bacterial contamination and provide clean drinking water. It can also be done as an initial treatment for all contaminated wells and should be a standard procedure following well drilling, after fitting new seals and after detection of bacterial contamination. 4) In cases where clean water cannot be obtained by improving well sanitation and in cases such as open wells and river water, slow sand filters provide an attractive technology for removing bacterial content and other contaminants such as cysts and organic material. Slow sand filters can be installed next to open wells and near rivers outside of the flood areas. In such applications they would serve more than one household and could be used as community water taps or could be piped to individual homes. Where slow sand filters are used for household tube wells, they can be designed in household unit sizes. Household-sized slow sand filters can, of course, also be used for situations in which water is carried from a source away from the house. 5) Solar disinfection provides a good method of purification in those situations where a water source is not of high turbidity and does not contain extremely high levels of bacterial contamination. Many household tube wells would fall within this category. In other situations pre-filtration of water through a bucket of sand or packed cloth may be used prior to solar disinfection. 6) In those areas of Nepal where there is not a supply of discarded plastic water bottles a distribution system of bottles must be established. Wherever plastic bottles are used for solar disinfection a program must be established to collect worn out bottles for recycling. If they are available, glass bottles will have a much longer expected lifetime and may reduce the need for a distribution and recycling system. Strong precautions must be issued against burning plastic bottles. The low cost technology of well sanitation improvement, slow sand filtration and solar disinfection can be of considerable benefit in providing clean drinking water in a number of areas. 1) Village water supply: In many villages now suffering the consequences of water supplies containing bacterial contamination, slow sand filtration, solar disinfection and well sanitation improvement can be the keystones of a program to provide clean water. 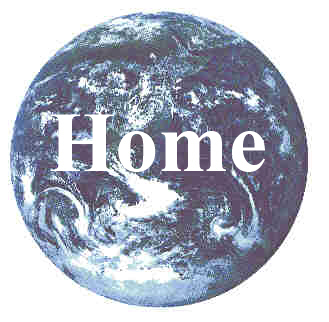 This may be the primary area of application of these technologies. 2) Urban water supply: In Kathmandu water spot checks of a dhara (village water spout) providing community drinking water in Bhat Bhateni and a cuvar (covered spring) providing drinking water in Chabil found these sources to contain bacterial contamination. With the cooperation and assistance of community groups, community slow sand filters could be installed in such locations. In other urban settings solar disinfection would be an affordable means of water purification for many families. 2) Schools: Solar disinfection is a simple, low cost technique that can be incorporated into school programs both to provide the students clean drinking water while at school and to train young "water emissaries" who can take the technology back to their homes. Several schools have expressed interest. School programs could be developed both in rural and urban areas. One goal might be to have training in solar disinfection included in all school health programs. 3) Health posts and medical clinics: Clean drinking water is not only important for general health, but for preparing oral rehydration formulas, for childbirth, for women's hygiene and for other health concerns. Providing slow sand filter and solar disinfection technologies for these agencies would not only provide them clean water but would allow them to serve as educational and training centers for the communities they serve. 4) Tourism: In many tourist areas plastic mineral water bottles have become an environmental problem. Providing clean drinking water through slow sand filtration or through solar disinfection to refill plastic bottles could reduce the number of discarded bottles and provide increased local income. Such a program would require the development of consumer confidence through extensive education and through rigorous quality assurance and testing. An area such as the Annapurna Circuit which has an established management structure, would be an ideal location to begin such a program. 5) Disaster relief: In times of flooding or other natural disasters, the supply of drinking water is frequently disrupted or supplies become contaminated and unsafe. Solar disinfection can provide a simple, low cost technology for disinfecting drinking water. Kits of blackened racks or reflectors, a supply of plastic bottles and simple tests for water quality could be included in disaster preparedness materials. Although the instructions for solar disinfection are quite simple, prior training of relief personnel in the techniques of solar disinfection would be strongly indicated. 6) Water quality testing: In all clean water programs, testing of water quality is essential in order to distinguish safe from unsafe water and in order to monitor the effectiveness of any purification methods. Programs can be implemented through health posts, schools, and district and village administrative offices to coordinate village monitoring programs and to make available simple presence/absence tests for biological contamination such as the hydrogen sulfide test.